I wish you all the best of luck on your search for a place that fits you best and your time in whatever campus you decide to join. Remember 4 years will fly fast so please make it a happy and healthy best four years of your life. This entry was posted in Academics, Me and tagged bye, senior life, this was fun on May 12, 2012 by Altagracia Montilla. After graduation I will be working with a non profit organization located just north of Chicago. The organization, the Schuler Scholar Program, chooses high achieving high school students from under privileged and under represented back grounds and prepares them academically, socially, and culturally, for competitive campuses like Skidmore and other known ivy league schools. I will be a scholar coach, available to the students during the day and tutoring after school. I will also travel with students to different campuses across the country. I have a passion for youth development. So this is a start in the perfect direction. I am beyond excited. And I must add Career Services helped me succeed in getting this job. They helped with the resume, the interviewing process, and the networking. 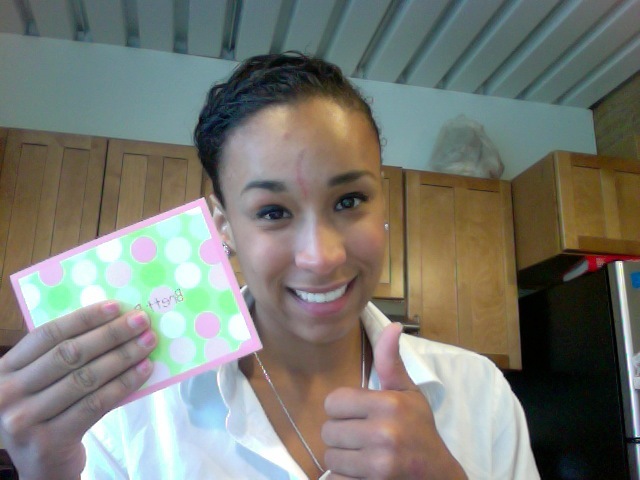 Thanks Megan of Career Services !! This entry was posted in Me and tagged the real world on May 12, 2012 by Altagracia Montilla. 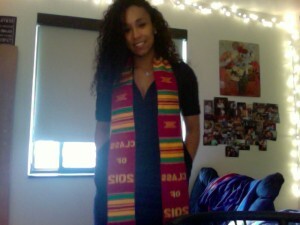 I received my graduation stole! Can’t wait to wear it over my graduation gown. This entry was posted in Uncategorized on May 12, 2012 by Altagracia Montilla. 7 Deadly Sins of Senior Week. Senior week officially started today. The kickoff included live music, and three hefty lines for picking up your SW bracelet- which gets us great deals in town, a SW mug, and a free Moe’s. The theme for senior week is the 7 Deadly Sins. Each day of Senior Week represents one of the deadly sins. For instance, Sunday is Sloth: sloppy, lazy, chill daze; an outdoor movie and cuddle fest. Monday is Lust: movin’ n groovin’ together: aband showcase and foam party. And so on. And if I am unclear on what senior week is. Its an entire week of planned events just for the seniors. Students, non- seniors, have begun departing on a journal to begin their summer vacations. Seniors stay behind, no classes, no work, just hanging out with fellow seniors reminiscing on the early days of college and enjoying the great events planned of course. The insane part is that we are on this happy high and then graduation happens and everyone is just crying for weeks. But let’s not think of that just yet. Time to enjoy senior week. 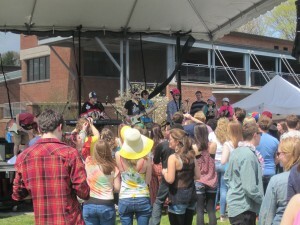 This entry was posted in Being a Senior, Events and tagged fun, senior week, so much to do on May 12, 2012 by Altagracia Montilla. My last exam was on Wednesday. Adult Development. I handed the exam in and thought “YES I AM DONE, FINALLY”. I called my best friend and cried. This entry was posted in Academics, Me and tagged done, its over, last one on May 11, 2012 by Altagracia Montilla. I totally forgot to post about the AdLibs show I went to sometime last week or so. Silly me ! The Ad Libs are an improve group on campus. The only improv group, If I am not mistaken. Last week they had their Spring show. Its all improve and fun humour. It has a somewhat “Who’s Line Is It Anyway” feel to it. Which I am more than okay with; great show, right ? Heres a short clip of the show- uh it involves improv songs and nose jobs. HARHAR LULZ. Watch to see what I mean. This entry was posted in Clubs&Organizations, Events and tagged comedy, funny, haha, improv, laugh, show on May 9, 2012 by Altagracia Montilla. How hard is it to get into Skidmore? What SAT/ ACT scores do I need? What is the average GPA of the incoming student? The hardest thing about communicating with prospective students about college and Skidmore is discussing tests scores and grades. No, Skidmore is certainly not the easiest school to get accepted to but its important to note that the admissions counselors want more than good numbers. They understand that you are more than just a test score and grade. You are a teen with interests, passions, and even stressors. I remember how stressful it was to be 16, to deal with the everyday stresses of being 16 topped with the stress of the darn SATs and ACTs. And to test what? Intelligence? Debatable. Test taking skills? Sounds more like it. Back when I was in High School it seemed that most of the students who did extremely well were the students who had been getting SAT/ ACT tutoring for years. And let’s not get into how expensive that can be. I am not saying there is anything wrong with taking advantage of the opportunity to have a tutor or take classes on how to take the SATs and ACTs. I am also not saying that one should not study. I am just stressing that there is more than numbers and you shouldn’t pull your hair out when it comes to test scores and grades. Make sure to let that “more than numbers” part of you shine. Schools like Skidmore that recognize well rounded students make great students will take into consideration the classes you have taken (when looking over grades), the extra- curricular’s, and the “it” thing about you and taking the time to interview is the perfect opportunity for you to show off that “it” thing. So please do not freak out if you do not get as high of a grade or score as the person next you because what can be more important to schools are those things that you have proven to be passionate about. This entry was posted in Academics and tagged ACT, average, preparation, SAT, scores, stress, test on May 5, 2012 by Altagracia Montilla. A few nights ago I attended what I believe was the best concert I have seen at Skidmore- The Spring Orchestra Concert. 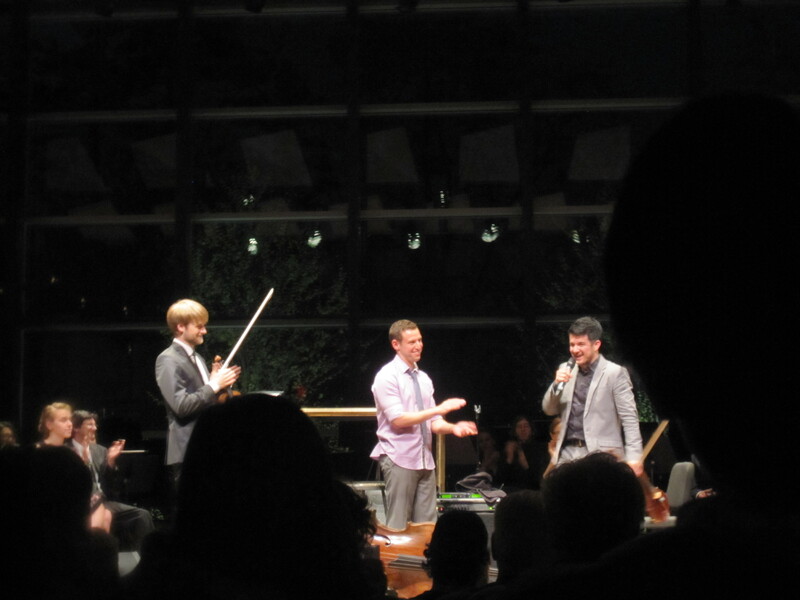 Time for Three, an unbelievable trio – Zachary (Zach) De Pue, violin; Nicolas (Nick) Kendall, violin; and Ranaan Meyer, double bass- opened for the orchestra and gave a jaw dropping, absolutely stunning performance. I was in awe. I think I was falling in love with this trio as they performed. I apologize for not recording their performance but you have to check their material, it is amazing. The second half of the show was The Skidmore College Orchestra, made up of both Skidmore College community members and Saratoga Springs community members. The orchestra was phenomenal as well. And what better place to view such a powerful concert than the Arthur Zankel Music Center. I sneaked a vid on a bit of the orchestra performing George Gershwin’s Cuban Overture. Enjoy ! This entry was posted in Events and tagged instruments good music, music, orchestra on May 5, 2012 by Altagracia Montilla. The weekend before the last day of classes I was like “OH HECK YES !! ITS OVER ! !” And then I remembered I still have two exams and three papers to get through before it is actually over- Wednesday evening. We all celebrate too early. Especially because of FUNDAY. What is FUNDAY you ask? Its the best day ever. It will be the best day of every year. 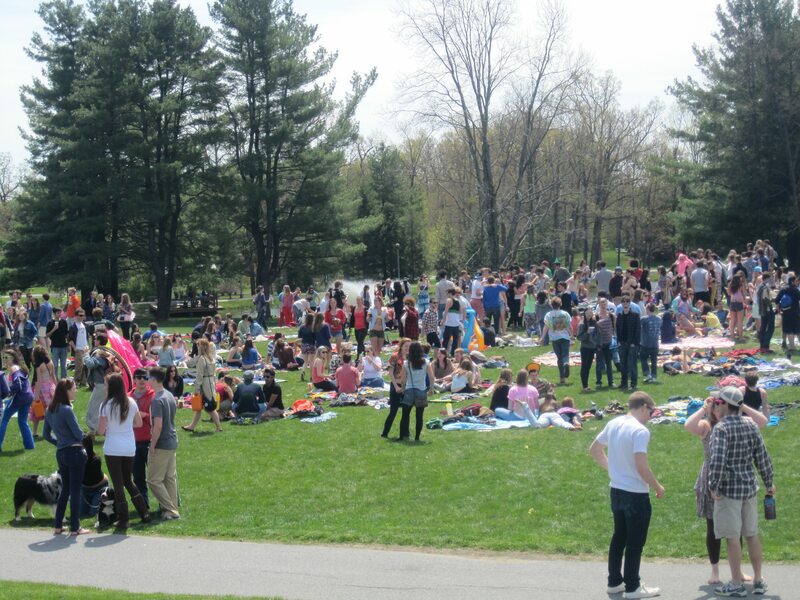 The Saturday before the last day of classes the entire campus celebrates on the green. 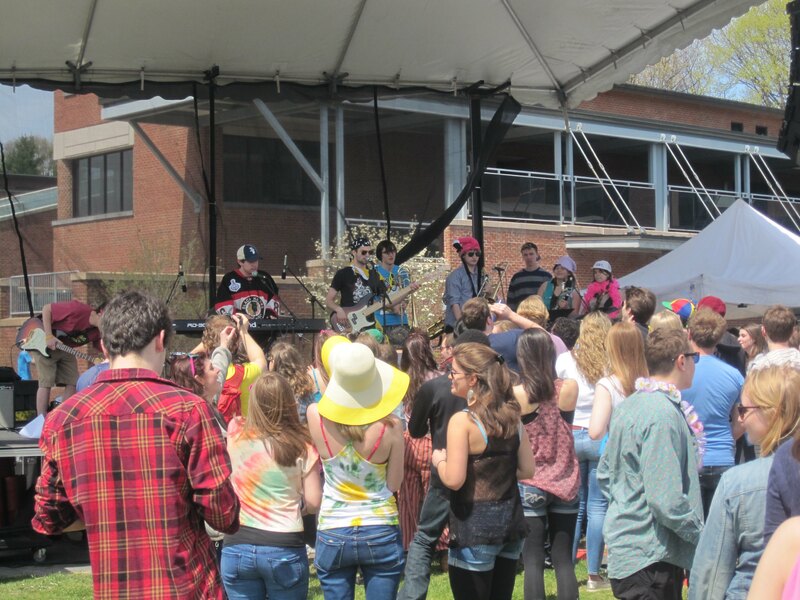 A stage is set for bands to play, bouncy houses are every where, theres a dunking tank, a DJ plays on the gazebo, and free food and gifts are also everywhere. The celebration on the green officially starts at 11:30am and goes on until 5pm. But all students wake up at around 9am excited beyond belief as if it were Xmas morning. This amazing day happened- I had a blast. But the next day I was like, “OH NO STILL SO MUCH WORK TO DO !! “. The last day of classes rolled around- last Tuesday- and I could not even get excited because I was still thinking about all the papers and exams I have to complete during finals week. Well that is what I am working on now, hence me being in on a Friday night. This entry was posted in Events and tagged fun, Fun Day, lets play, pre celebration on May 5, 2012 by Altagracia Montilla. As a tour guide it’s always so sweet to receive thank you emails, cards, and phone calls from families I gave a tour to. So just wanted to let Brett from MA know, I received your thank you card! I’m glad you and yours enjoyed the tour. This entry was posted in Uncategorized and tagged awwwww, how sweet !, prospective, thank you, tour on May 1, 2012 by Altagracia Montilla.